Q How much shrinkage in drying should we see in yellow-poplar and Eastern cottonwood lumber? A This sounds like an easy question to answer -- all I have to do is look up the numbers in a book. But there is much more to this. So, shrinkage numbers in “the book” for green to 0 percent MC for yellow-poplar are 4.6 percent radially (the width of a perfectly quartersawn piece of lumber) and 8.2 percent tangentially (the width for a perfectly flatsawn piece of lumber). Note that these are average values. You may have heard the expression that says “No two pieces of wood are alike,” so there will be some variation in shrinkage from tree to tree, and even from different locations in the tree. There are several problems with these average numbers, however. First, we typically only dry to 7.0 percent MC and not to 0 percent MC. So, we need to adjust the numbers by 75 percent. So, the shrinkage from green to 7.0 percent MC would be 3.4 percent radially and 6.2 percent tangentially. 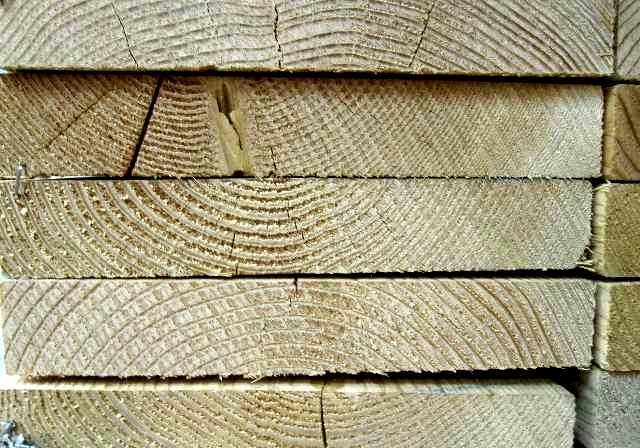 The second problem is that we would hardly ever have a true quartersawn piece; that is, there might be some quartersawn regions, but unless the rings are at 90 degrees to the faces, there will be some spatially tangential grain so the 3.4 percent shrinkage number is too little for almost every piece of lumber. At the same time, it is also almost impossible to have a perfectly flat sawn piece of lumber. That is, there will be some grain that is partially quartersawn. So, the 6.2 percent shrinkage number is too large for a piece of lumber. The shrinkage numbers were based on small shavings and not large pieces of lumber with less than perfect quarter or flat grain. A large piece of lumber overall, due to its thickness also shrinks less than a thin piece of shaving. In fact, 8/4 shrinks less than 4/4. So, what does all this mean? For quarter and rift sawn yellow poplar, I believe you will find an average width shrinkage of 4.1 percent, with 0.5 percent variation, but very few outside this. Likewise, for flatsawn lumber, an average would be 5.1 percent shrinkage, with some very flatsawn pieces being slightly higher. (Maybe you have heard that some lumber sellers take the kiln dried footage and add 8 percent to the volume to account for shrinkage and charge you the inflated footage price. A good kiln operation will steam the lumber at the end of the drying recycle to cause the collapsed cells to spring back to their original shape. So, ignoring collapse, the average width shrinkage in drying quartersawn eastern cottonwood to 7.0 percent MC is 3.4 percent. For flatsawn, 6.0 percent. 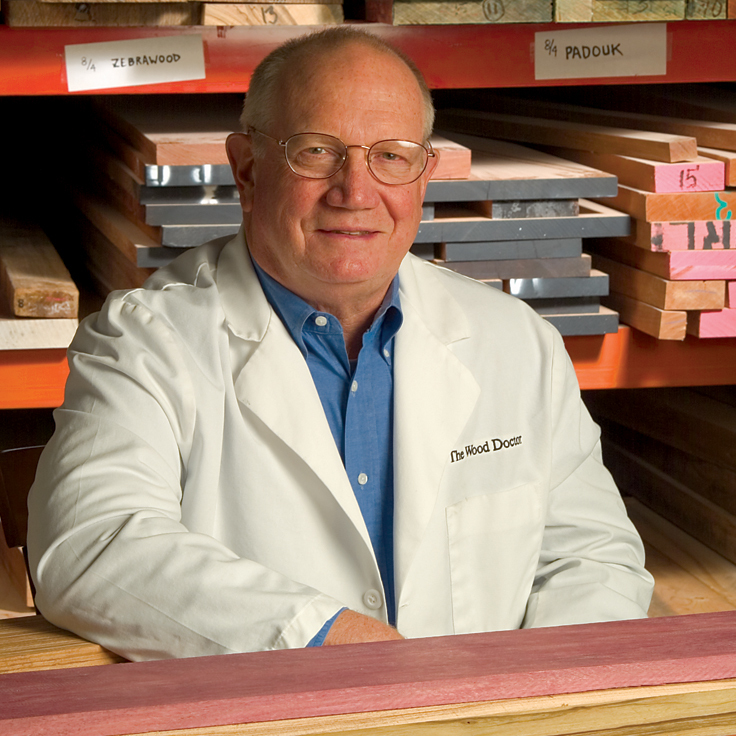 For the record, about 40 years ago when I was at the U.S. Forest Products Lab, we did measure the shrinkage of lumber during drying for many species and 6 percent was a typical value. Q What is heart pine? Thanks. A In general terms, “heart pine” often refers to the heartwood (which is reddish in color; the redder, the better) from one of the southern pines. But almost everyone who specifies “heart pine” is really looking for lumber from the heartwood of the longleaf pine tree. This tree, which grows very slowly (8 rings per inch or more) and lives for a century or more, was the dominant tree in much of the South prior to the 1850s or so. Its tight rings, high strength, long-wearing surfaces, and widespread availability resulted in it being heavily cut over three centuries. Today, very few longleaf trees exist and most of these cannot be cut because this tree, when over 75 years old, provides the needed nesting habitat for the endangered red cockaded woodpecker. When it comes to positive identification of a piece of heart pine lumber that is from the longleaf pine tree, we can easily tell by the reddish color that the wood is heartwood. Further, examination under magnification reveals if the wood is from one of the 10 southern pines, also called hard pines. Finally, closely spaced growth rings (8 or more per inch) would be characteristic of antique heart pine. However, the truth is we cannot identify a piece of suspected “heart pine lumber” positively as longleaf pine. So, when buying “antique heart pine” lumber, we must rely on provenance and credibility of the supplier who salvaged the wood. Q We are getting a lot of cupping in some of our lumber. What is causing this and what can we do to fix it? A Cupping, which is warp across the width of lumber, is a natural event for wood, with the bark side of lumber shrinking more than the heart side (or side closest to the center of the tree). This fact means that perfectly flatsawn lumber cups the most; perfectly quartersawn does not cup at all. Also, the closer the lumber is to the center of the tree, the greater the difference in shrinkage between the two sides and therefore the greater the cupping tendency. This fact means that lower grade lumber, which is usually closer to the center of the tree, will cup more than clearer lumber from further away. When drying lumber, if the wood is dried fairly quickly, meaning at a low RH, then the outer fibers will be dry, which means they are fairly strong. These dry strong fibers resist cupping. However, if partly dried lumber is rewetted, which means the fibers become weaker, or if the drying conditions have a high RH, meaning that the fibers are not as strong, then cupping will be more severe. In my experience, cupping is often the result of mixing MCs in a kiln. The high RH used to protect the wetter lumber will weaken the fibers on the drier lumber and the drier lumber will cup. Cupping is also accentuated if the lumber is over-dried. Even if the MC is increased after over-drying, the cupping does not moderate much. 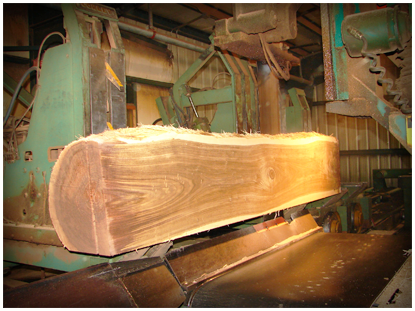 Over-drying can occur when MCs are mixed in the kiln and the drier lumber's MC is not monitored. So, as a short answer, check for anything that you are doing to rewet the partly dried lumber and check to see if some of the lumber is being over-dried. What causes grain to raise up on boards we've just sanded?